I owe you all an apology. Remember a few months ago? When I took a little 2 week vacation that turned into three? And I came back all refreshed and ready to rock ‘n’ roll? More like my fake comeback. Sure. I came back. And I churned out a few posts. But having the time to craft the kind of posts I wanted? Making the time to read the so-very-many blogs of yours that I enjoy reading? And I began feeling like a failure. Because I couldn’t measure up to my self-imposed grading scale as a blogger. Hovering at a D-, I struggled to write/read/comment. And then? In my personal life – the proverbial *&%$ hit the fan. Not once. Not twice. But every single day. For about 19 days straight. I’m not exaggerating. Just ask my therapist. Or my husband. Or my kids. Or the people who rent our old house. We were all hanging by a thread at Chez Jane’s for most of December. With crap flying in all directions you’d think I’d take another blogging break. But nooooo. I didn’t. I couldn’t. I just took one in November. I couldn’t take another in December, too. That would be unacceptable. Unheard of. Another break? That would be admitting that I just couldn’t handle the pressure. I’m not weak. I’m strong. I am woman. Hear me roar! Acting all tough, I published my “I Don’t Give A Flip” post. But then one of you called me on it. (Ahem, Katybeth.) And then another (Yes, you… Barry) sent me a Get-Out-Of-Jail-Free-Card. From his male perspective, he wonders aloud why we women put ourselves through the paces? Why do we set impossible goals and expectations for ourselves? Are these expectations real or imagined? What a concept. 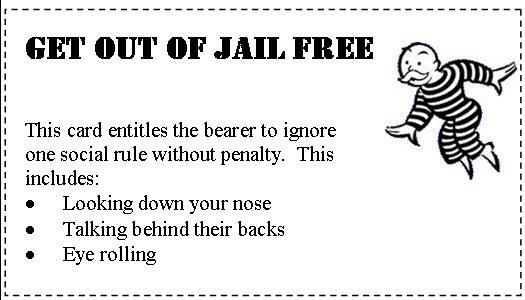 Get out of jail free. Go to the bakery section of Publix instead of staying up until 2am baking cookies for #2son’s Christmas party at school. Jarred spaghetti sauce instead of homemade when the in-laws come to town. (Hide the jars deep in the recycling bin and they’ll never know the difference.) Say “no” to yet another volunteer request from the pushy neighbor on the pool committee. No longer behind bars, I’m going to venture out there with new expectations for myself that have way more wiggle room than before. I have choices. I can take a detour. Or the easy way out. 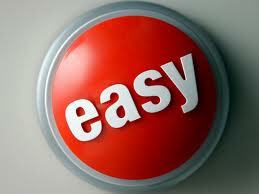 No, make that the easy button! And it’s all going to be OK. The world will not spin off its axis. My family will survive. My blogging buds will understand.